The Reach4Success website is a program that originated with the Consortium of Universities of the Washington Metropolitan Area. The website provides information on the College Information Center where students and families can get help completing admission and financial aid applications. The website has a calendar that lists college admissions related events. The resources section provides useful links to other websites rather than provide its own information. The District of Columbia College Access Program (DC-CAP) provides resources to public high school students including counseling, scholarships, and advisor support through college. The organization also provides college tours. Students can contact DC-CAP advisors in their local high school. District of Columbia residents should visit the Office of the State Superintendent of Education for information on Higher Education Financial Services. The District of Columbia’s Tuition Assistance Grant (DCTAG) provides up to $10,000 toward the difference between in-state and out-of-state tuition at public four-year colleges and universities throughout the US. College Goal Sunday in DC is run through the YMCA. You can find more information at College Goal DC. There are eight four-year District of Columbia colleges with 500 or more full-time undergraduates according to the Integrated Post-secondary Education Data System. Approximately 95 percent of students attend one of the seven private DC colleges while five percent of students attend the one public institution. 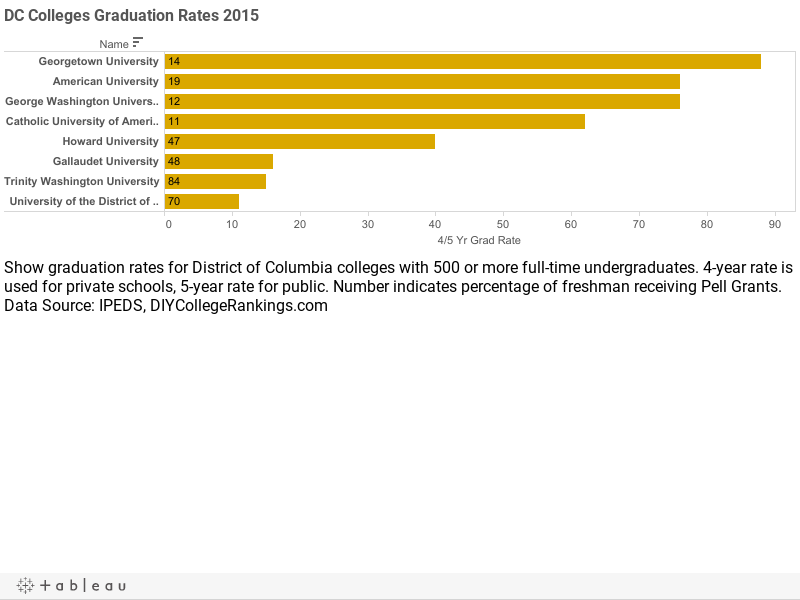 The private DC colleges have an average four-year graduation rate of 53.3% and the public university has an average five-year graduation rate of 11%. Only one District of Columbia college met the DIY College Rankings 50-50 profile requirements. The average SAT score for college-bound seniors in the District of Columbia was 440 for Critical Reading and 438 for Math. The 75th percentile scores were 550 for Critical Reading and 550 for Math. Of the schools that reported SAT scores, five colleges had 75th percentile scores equal to or higher than the state in both categories.